IfM Education and Consultancy Services is helping to map out the next 30 years of the Australian rail industry following the great success of the Automotive Australia 2020 Roadmap undertaken in 2009. Working in collaboration with The Australian National University (led by ANU Edge), the CRC for Rail Innovation and Strategic Connections Group, IfM ECS is helping to create a roadmap to support an effective and efficient rail supply network well into the 21st Century. 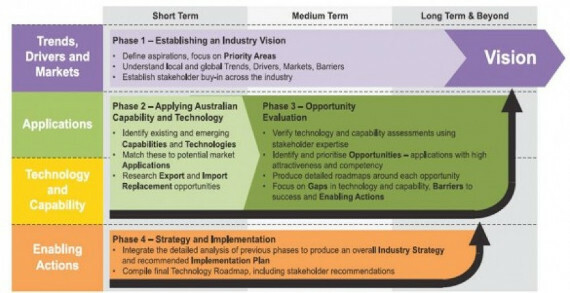 IfM ECS, a world leader in roadmapping practice, were commissioned a second time, following the success of the earlier Automotive Australia 2020 Roadmap. Australian Government appointed Rail Supplier Advocate Bruce Griffiths initiated the railway project, based on first-hand experience from participating in the automotive roadmap and having witnessed how beneficial it was to both the industry and his own automotive company. A team of Commonwealth government, state governments and industry supporters were gathered to fund and drive the project forwards. Roadmapping is used by a wide range of organisations and industry sectors to facilitate communication, collaboration and shared decision-making. It attempts to answer three key questions: Where are we now? Where do we want to be? How can we get there?